The Reliance Jamnagar refinery is the largest in the world, and it is also quite possible the largest FOUNDATION Fieldbus installation in the world with over 22,000 fieldbus devices. There is an interesting article in the Oil and Gas Journal on the refinery expansion project that is worth a read. Invensys Operations Management is the primary automation system supplier for this project and there are a lot of details on their scope of supply, etc. Our Brazilian Marketing Committee organized and held our most recent end user seminar on Thursday, June 16th at the Windsor Barra Hotel & Congressos in Rio de Janeiro. Brazil is a hotbed of fieldbus adoption right now. Major end users such as Petrobras are making significant investments in FOUNDATION Fieldbus. The seminar attracted roughly 150 attendees from end users to suppliers to systems integrators. 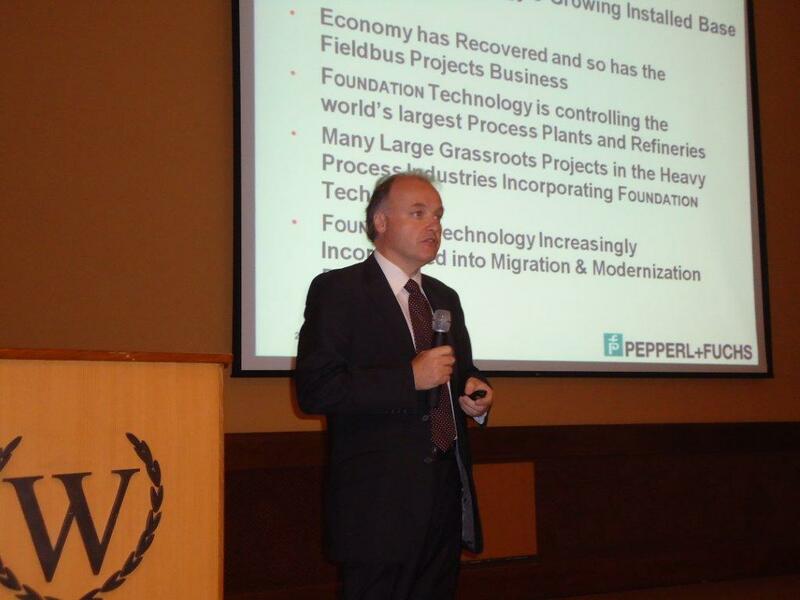 The keynote address was given by Dr. Gunther Kegel, the new Chairman of the Fieldbus Foundation Board of Directors and CEO of Pepperl+Fuchs. Dr. Kegel listed some key FOUNDATION Fieldbus installations in Brazil, where the technology is in use in over a dozen refineries, several offshore platforms, and many other installations which, for end user Petrobras alone, accounts for around 70,000 fieldbus devices. Local supplier Smar also has many fieldbus installations throughout the country. Omar Sacilotto Donaire of Smar gave an update on the FOUNDATION Technology roadmap. Other end user presenters included Elaine da Silva of Petrobras and Ronaldo Neves Ribeiro and Alessandro S. Castro of Celulose Nipo Brasileira (a leading Brazilian pulp producer). With all the fieldbus activity in Brazil, there is a strong demand for training. LEAD is in the process of becoming a certified FOUNDATION Fieldbus training center under our FCTP program, and Miguel Borges from Petrobras/Cenpes provided on update on LEAD’s status and future plans. Fieldbus Foundation’s Brazil Marketing Committee Chairman and Pepperl+Fuchs Marketing Director Augusto Pereira of Pepperl+Fuchs gave a presentation on bests practices for fieldbus project implementation. The seminar concluded with a presentation from another end user, Claudio Sperb from Braskem, on successful project implementation. The Braskem example is interesting because it involves ethanol production. Brazil implemented a comprehensive ethanol fuel production program to deal with the oil crunch of the 1970s and has been a leader in ethanol production ever since. Today, it is the second largest producer of ethanol in the world and has some of the most advanced production processes. Most of the country’s ethanol comes from widely available sugar cane. The presentations can all be downloaded at the Fieldbus Foundation Forums web site, but you must be a registered user to download. Registration is free and only takes a minute. Warning: most presentations are, understandably, in Portuguese. If you are in the area you should take the time to register for and attend our end user seminar in Rio de Janeiro coming up in just a couple of days on June 16th. Fieldbus Foundation Chairman and Pepperl+Fuchs CEO Dr. Gunther Kegel will be delivering the keynote address. The event will be held at the Windsor Barra Hotel and the agenda can be accessed at the Foundation web page here. Those familiar with FOUNDATION Fieldbus know that Brazil is a hotbed of fieldbus adoption, with leading end users like Petrobras investing heavily in the technology. Come meet with industry leaders and learn more about FOUNDATION Fieldbus in Rio! I was pleased to see that FOUNDATION Fieldbus technology will be used in Europe’s largest carbon capture project. Emerson Process Management recently announced that Doosan Power Systems will be installing an Emerson Ovation system on a new carbon capture demonstration facility that “will be the largest in Europe, capturing 100 metric tons of carbon dioxide per day — the equivalent of what might be produced by five megawatts of coal-fired power generating capacity. ” FOUNDATION technology will be used in conjunction with Rosemount high density temperature transmitters. High density temperature measurement is one of the more promising recent applications of FOUNDATION Fieldbus and can provide impressive results for things like temperature profiling that can be used to diagnose the health and efficiency of key plant assets. The first end-user seminar hosted by the recently expanded Fieldbus Foundation Benelux Marketing Committee (FFBeneluxMC) has met with great success. The event was held in Belgium on Thursday, May 19, at the Acta vzw training centre in Kalmthout, near Antwerp. A large audience of more 75 delegates, including around 40 end users, attended the seminar. Rob van der Zwan, chairman—FFBeneluxMC, opened the seminar’s afternoon session by introducing the new Benelux Marketing Committee and unveiling its new logo. Hans Musters, Acta, also welcomed the delegates to the Acta training facility and gave a brief overview of the training centre, the facilities, and its activities. Bindert Douma of the STC Group’s Brielle training centre held a “Training Teaser” session in which he gave an overview of the five-day FOUNDATION fieldbus training course available at the Brielle facility in the Netherlands. Douma is a certified trainer, who we recently wrote about in this blog, from the STC Group’s Brielle training centre, one of the first training establishments certified under the FOUNDATION Certified Training Program (FCTP). Louis Claessens gave an informative end-user insight into the lessons learned through the implementation of FOUNDATION technology in the BASF Antwerp facility. He concluded by advising potential implementers of a FOUNDATION system to strike up and maintain a close working relationship with the system supplier, understand the principles of the system, and follow implementation recommendations closely. Rob Sosef, FFBeneluxMC member, presented the operational and economic benefits of Control in the Field (CIF), a key advantage of FOUNDATION technology. Marcel Vennemann gave a short introduction to the proposed FOUNDATION Fieldbus Knowledge Centre, an FFBeneluxMC initiative due to be established soon. Discussion forums after each presentation offered a unique opportunity to share end-user experiences and included open question-and-answer forums. This multi-directional flow of information is vital for established and prospective users of the technology and to the Fieldbus Foundation and its members supplying FOUNDATION products and services. Attendees enjoyed a complimentary buffet dinner during which tours of the Acta Training Centre were organized. Acta’s Pieter d’Espallier conducted live demonstrations in the facility’s demonstration room, which houses a complete, functioning FOUNDATION fieldbus system. The week of May 24th we held our first of the Americas end user and sales force training seminars. Thanks to the help of the local Los Angeles ISA chapter we were able to attract around 60 registered attendees, most of them end users with a lot of good questions to ask. This year marked a new format for the Americas seminars, which focuses much more on practical application of FOUNDATION Fieldbus technology, with sessions on successful segment design and installation, commissioning, control in the field, and device diagnostics. Emerson Process Management, Rockwell Automation, and Yokogawa all had demo systems on display incorporating a range of third party devices from suppliers like Moore Industries, Phoenix Contact, Pepperl+Fuchs, Yamatake, Endress+Hauser, Smar, and others. We created short YouTube videos based on the three primary demos that are available on our new YouTube channel. A couple are still awaiting approval, but in our first video, Al Dewey of Emerson Process Management discusses the value and practical application of FOUNDATION Fieldbus device diagnostics capabilities, including a control valve. Control valves represent a particularly lucrative opportunity when it comes to FOUNDATION Fieldbus because more money is proportionally spent on control valve routine maintenance, much of which can be avoided through the use of fieldbus diagnostics capabilities. Look for more videos from the seminar soon. Travis Hesketh of Emerson Process Management has written a good article on the benefits of control in the field on the Process and Control News Europe web site. The function block structure, which enables control in the field, has always been one of the key differentiators of FOUNDATION technology. Control in the field allows end users to fix the setpoint closer to the control limit, providing greater energy efficiency and raw material utilization. CIF also provides single loop integrity, so the loss of a control loop does not result in an unplanned shutdown. The loop stands on its own, and can continue to function even if communciations with the system are lost.